Nature is filled with a wide variety of beneficial insects whose diet consists mainly of the little pests that invade your gardens. Yes, there really are "good bugs" and they are a great way to combat the pests that are ready and waiting to devour and destroy your plants. Some of these good guys may have been hanging around and you didn't realize they were actually keeping pests off of your favorite flowers or vegetables. Let's take a look at some of these beneficial predatory insects so you can learn who your allies are. I've done it myself, I see a bug and immediately I'm ready to squish! Now that I have become more familiar with my garden friends, I'll take a closer look first. Since I have learned to recognize these beneficial insects, I am one step closer to maintaining a healthy ecosystem in my garden. Ultimately, nature knows best and takes care of itself. 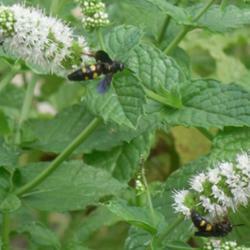 There are plenty of plants and flowers that attract beneficial insects. The good bugs are not only attracted to the plants that are infected with their insect prey, but they are also selective about the plants on which they will lay their eggs. Many of them will also dine on the nectar and pollen of their favorite plants. 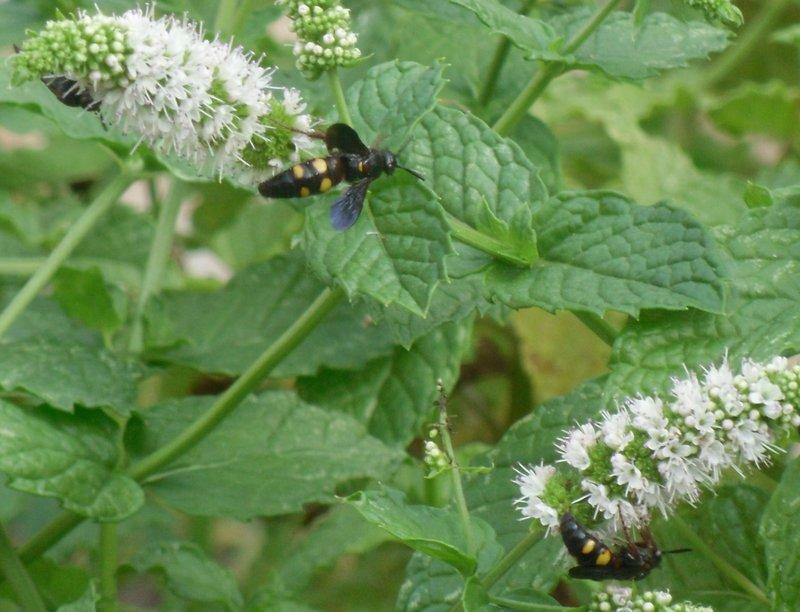 A variety of herbs or species plants are great at attracting beneficial insects as well as various annuals and perennials that you can add to your landscape. If there is a certain pest that you are having problems with, do some research to learn what plants will attract the predatory beneficial insects that will assist in combatting your problem bug. The benefical insects to follow are what I consider the "good beneficials;" since they prey specifically on pests. So, if you see any one of them in your garden, you know they are there in a beneficial capacity. There is another group of beneficial predators that are considered "Generalists" meaning they will take out another beneficial bug just as readily as a pest. (I've listed a few of these bugs at the bottom of this list). These are still beneficial insects and, typically, the good out-weighs the bad. Although being non-discriminate, some, such as a butterfly gardener, might not find them to be beneficial to their needs. 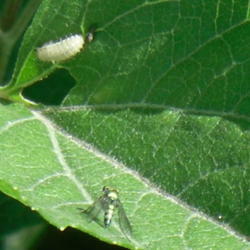 There are also parasitic wasps that seek out larvae on which to lay their eggs. The larvae could be butterfly caterpillars just as easily as cutworms. The backyard gardener growing vegetables will find these wasps, such as the Braconid wasps to be very beneficial as they feed on moths, beetles, caterpillars and fly larvae. 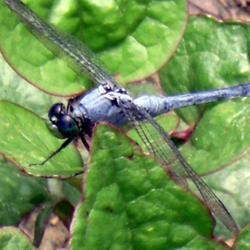 The big-eyed bugs, identifed by their bulging eyes, are quite small - reaching an average of about 1/8th inch in length. These are true bugs in the order Hemiptera. 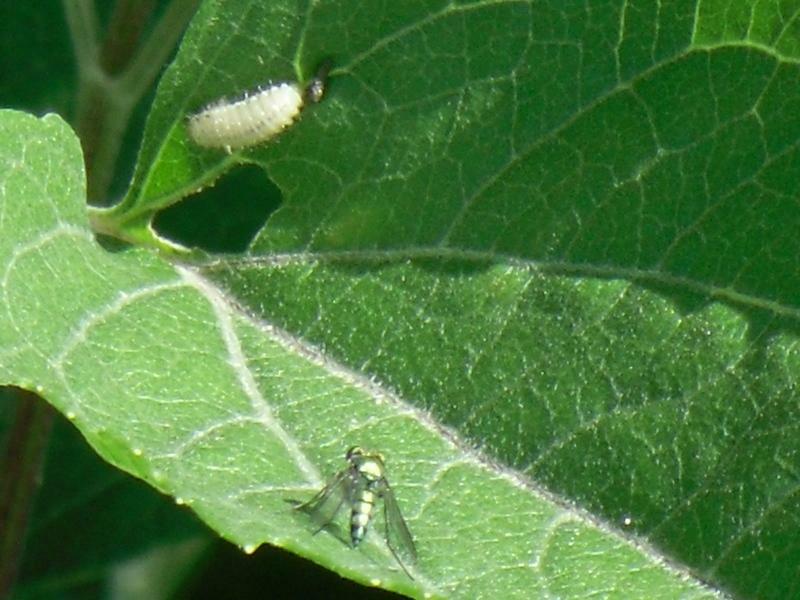 Both the nymphs and adults prey on many insects including insect eggs, cabbage loopers, flea beetles, small caterpillars, spider mites, and whiteflies. 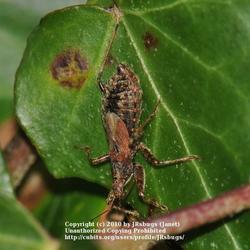 Damsel bugs will blend in with their surroundings, wearing a dull brown coloring. These are soft bodied, winged terrestrial predators with stick-like legs. 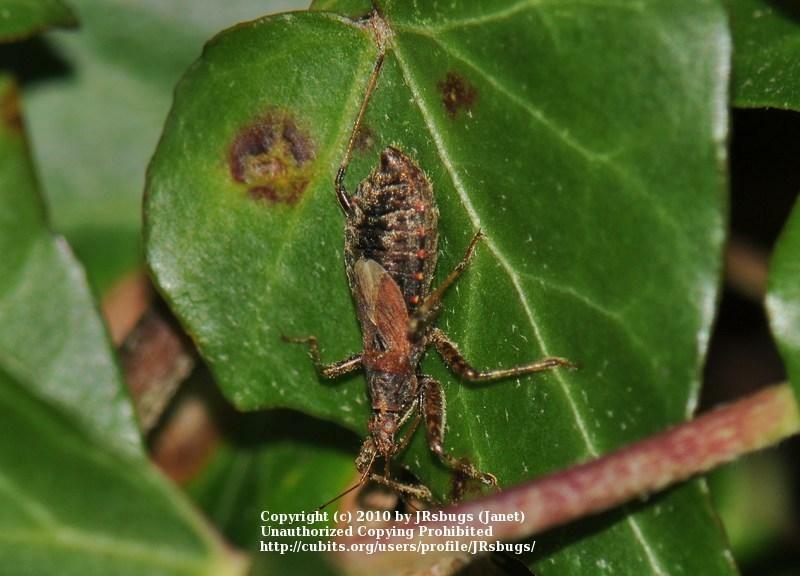 They use their thick front legs to grab their prey and feed on aphids, leafhoppers, lygus bugs (which includes over 40 species of plant feeding insects in the Miridae family), thrips, and even small caterpillars. 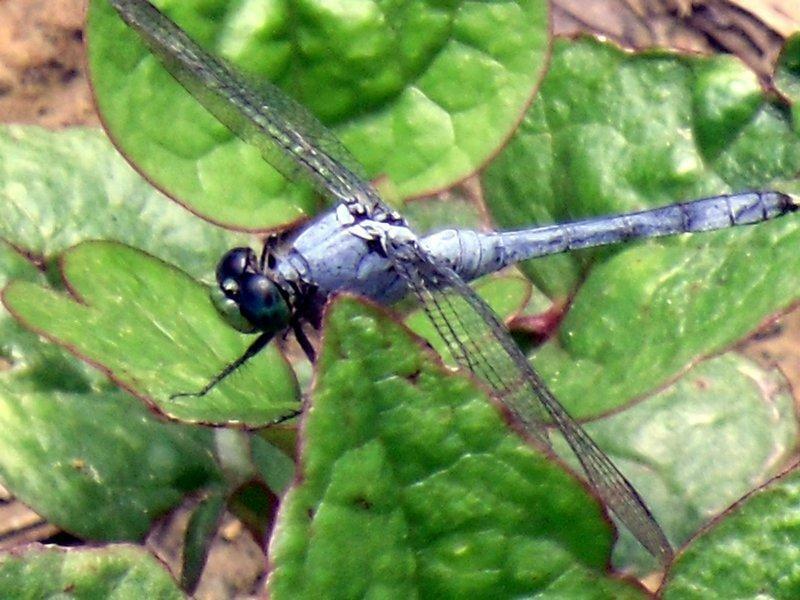 Dragonflies dine on mosquitoes and small flies, including gnats, midges, swarming ants, swarming termites, or other flying insects small enough for them to catch. Nymphs feed on aquatic insects, including mosquito larvae. Syrphid flies are also known as hover flies because they tend to hover over flowers. Usually, the syrphid flies have bright markings of yellow-orange and black and are often mistaken for bees. Syrphids have just two wings, which may take a closer look to identify. Syrphid flies prey upon aphids, mealybugs and leafhoppers. 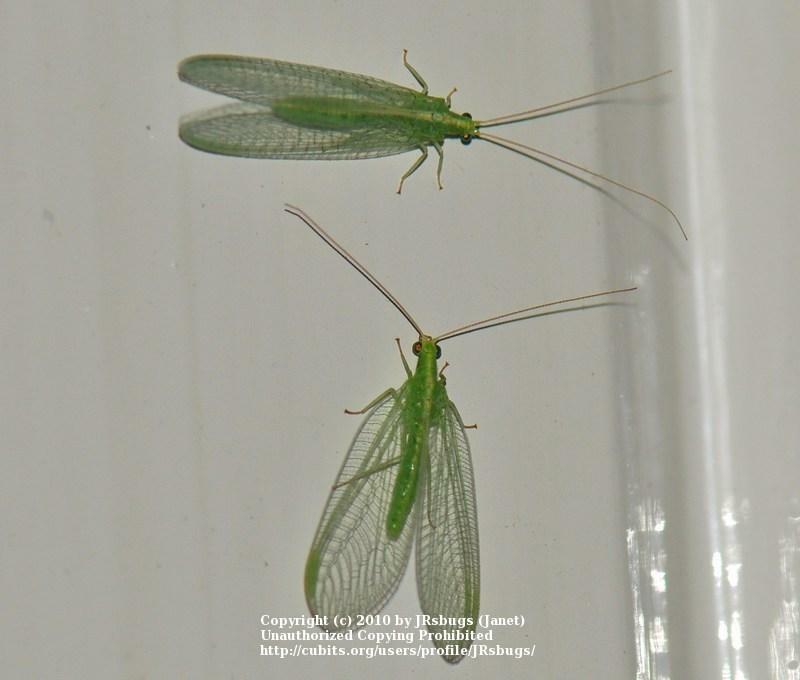 Green lacewing adults feed upon pollen, nectar, and honeydew. However the green lacewing larvae are voracious predators; nicknamed "aphid lions;" using their curved and pointed mandibles to stab their victims. 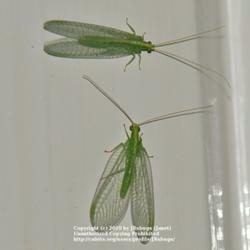 They prey upon many insects, including aphids, mealybugs, mites, scale, thrips, whiteflies, and even other lacewings. Everyone knows and loves the ladybugs, but it's the young larvae that devour more pests than the adult. 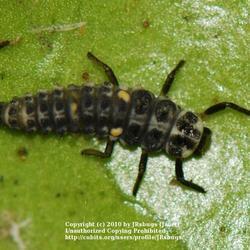 The lady beetle larvae look like tiny, colorful alligators with appetites to match. Learn to recognize them so you don't mistake them for pests. 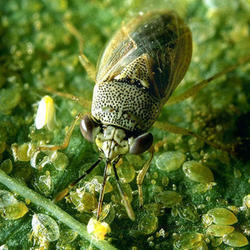 They prey upon and eat aphids, mealybugs, mites, scale insect, spider mites and thrips. The long legged fly is a member of the Order Diptera (true flies) and measures about 1/4th inch. 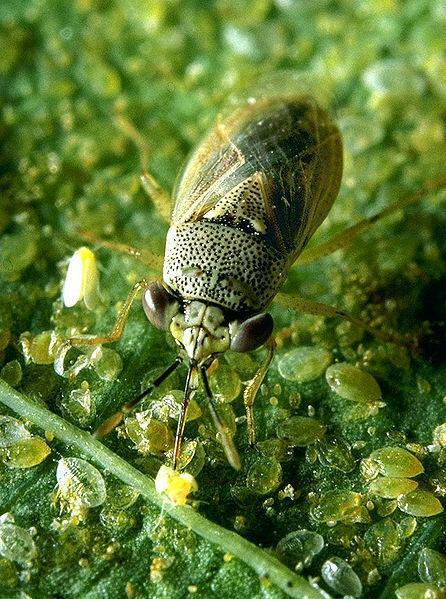 It preys and feeds on small insects and larvae, spider mites, thrips and aphids. They particularly target spider mites. These long legged flies have slender bodies with eyecatching metallic coloring of green, blue, and gold or silver. For a fly, they're pretty, I think. 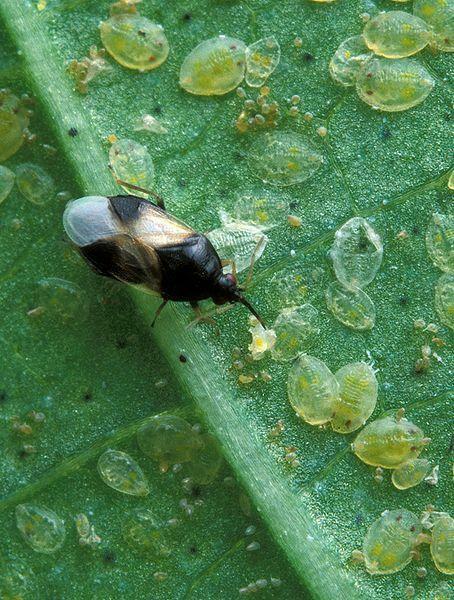 These tiny (1/16th" long) bugs feed on almost any small insect or mite; including aphids, corn earworm, leafhopper, mites, scale, small caterpillars, spider mites, thrips, whiteflies. They are particularly attracted to thrips in spring. All stages of this predator consume pests. 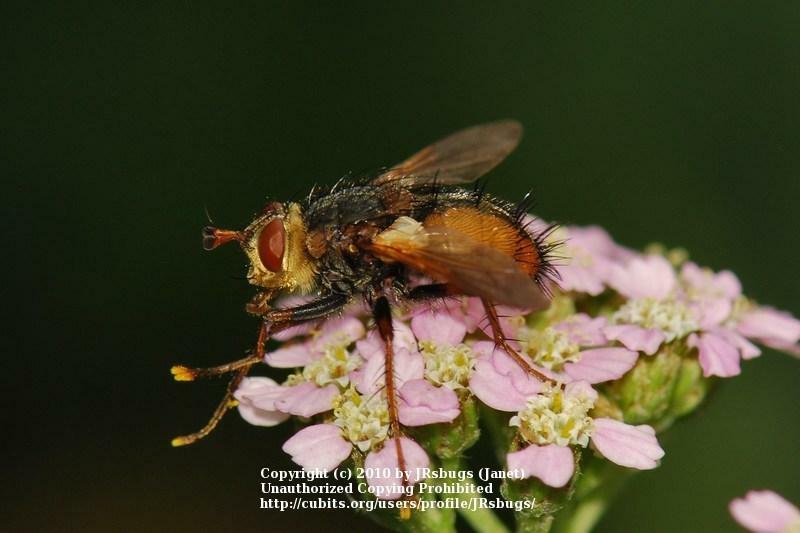 Tachinid flies are considered extremely beneficial because of their diversity. 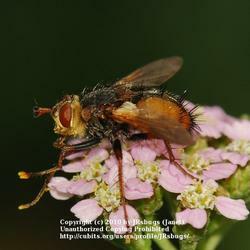 Tachinid flies are parasites of many caterpillars (army worms, cabbage looper, corn earworms, cutworms, imported cabbage worm, pink bollworms, tent caterpillars) also beetles, codling moths, grasshoppers, peach twig borers, saw flies, stink bugs, squash bug & nymphs, fly larvae, and many true bugs. These flies will use a variety of tactics as they move in uninvited and proceed to eat their hosts. 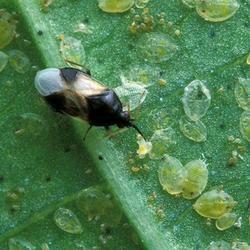 They may glue their eggs to the host or lay eggs on foliage where the host larvae will eat them. Assassin bugs are known for taking care of business. These true bugs use trickery, disguises, or brute force to capture a meal. 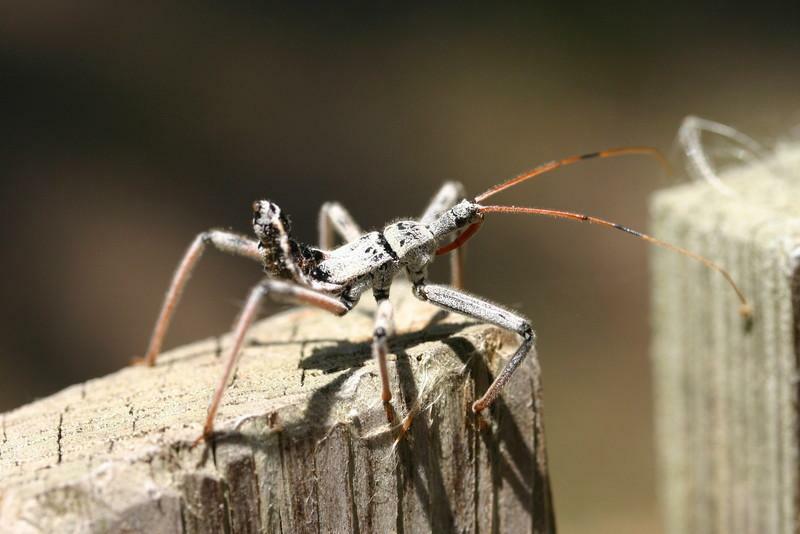 There are over 100 kinds of assassin bugs in North America. 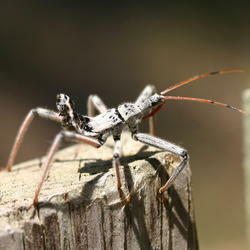 Pictured is an Assassin Wheel Bug, Arilus cristalus, one of the true bugs in the Hemiptera order. These are one of the largest true bugs in existence, reaching 1 1/2" in length. These unforgettable bugs move in slow motion but it doesn't slow down their voracious appetite. Although they are "generalists," the wheel bug preys mainly on what are considered harmful insects, making them very valuable garden allies. 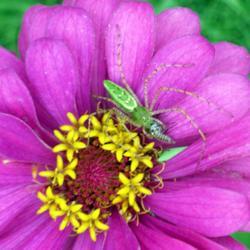 Avoid contact with these bugs, as they can inflict a painful pierce to your skin. 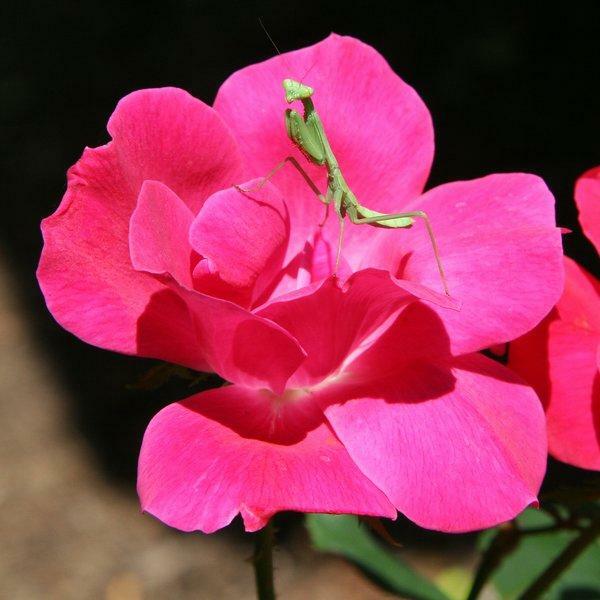 The Praying mantids will eat any insect that it catches, including beneficial ones. The same with the nymphs; from the time they hatch they have a large appetite and are even known to eat their siblings. Although a generalist, it is considered a beneficial insect and can handle even the largest of garden pests. They can camouflage very well and are actually hard to spot in the garden. Spiders are actually Arachnids - not insects; but are definitely noteworthy in the beneficial department. The most notable differences between spiders and insects are: spiders have eight legs, where insects have six, and spiders can produce silk throughout their lifetime. 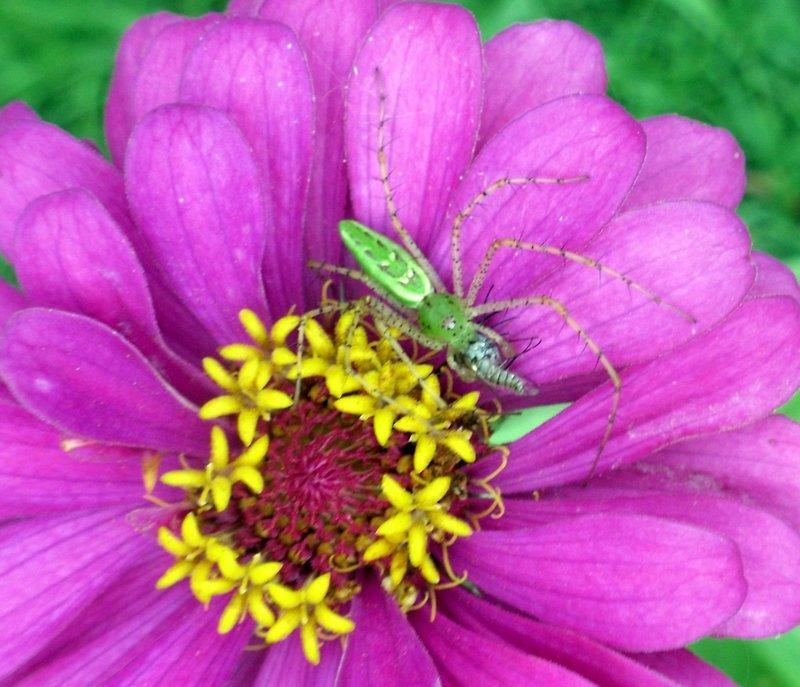 Pictured is a Green Lynx Spider, Peucetia viridans that gets its name for the way in which they sometimes pounce on their prey in a cat-like manner. In spite of their "generalist" eating habits, spiders are considered a natural controller of insect pests, and are beneficial. Both chemicals and pesticides are not prejudiced to what insects they kill. They can also kill other living things, such as the bird that eats the insect.